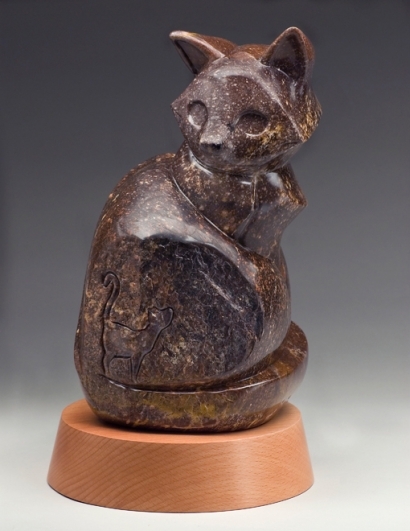 “Me and My Shadow” is a stone sculpture made in celebration of friendship, in this case that of two cats. When we moved from a condo to a house, he had to leave his best buddy, Ginger behind. Ginger came to visit a couple of times, but it wasn’t the same as having her as a neighbor. Brian and I adopted a small, speckled kitten as a new friend for Shadow and they became fast friends. Lunette, the kitten, followed Shadow everywhere–she was, indeed, his shadow. Hence, the title of this sculpture. If you look in the lower right corner of the sculpture, you will see a small, low relief carving of a little speckled cat.